Chewy.com is a company that cares what their customers think. 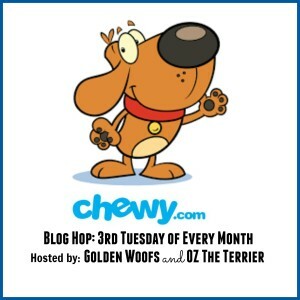 That's why they send out a few select products each month for pet bloggers to review. 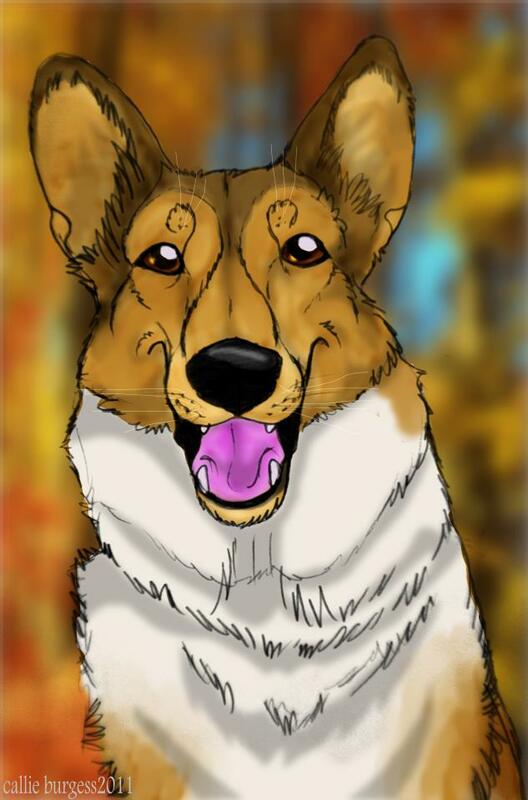 We love the awesome folks at Chewy.com, they pride themselves on their customer service, and we are happy to be part of the #Chewyinfluencers campaign. 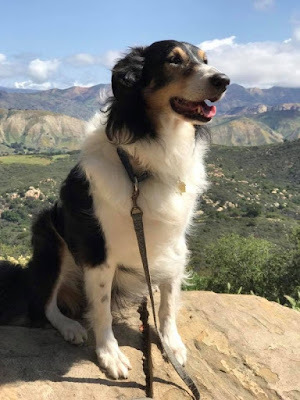 The collies really enjoy trying new products, and I love sharing our reviews with our readers. 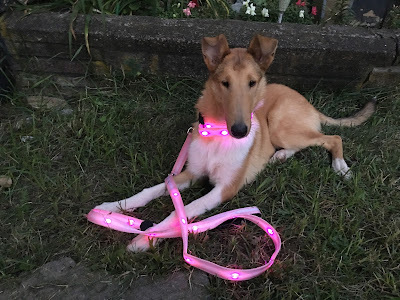 This month we were sent a Nite Beams Led Pet leash and the matching Nite Beams Led Pet Collar. These leashes and collars come in different colors, and we chose the pretty pink for our girls. They do have a pretty blue color too, but with all of Ryder's fur, we decided our smooth girls would be the better models for this review. 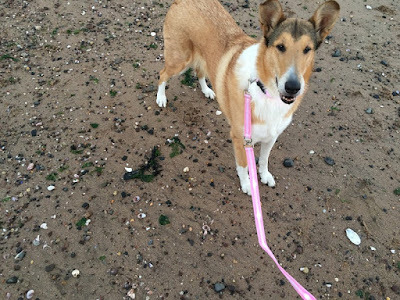 The leash and collar are fun and they look great on the collie girls! Scarlett thinks it was made just for her! The collar is adjustable, and fit both our adult collies and our 6 month old puppy, Winter. We were sent a large, but the collar comes in multiple sizes. And it is more than just a fashion statement, this leash and collar actually help to keep dogs safe! At night, as the sun begins to set, it becomes more difficult for drivers to see our dogs when we are out taking a walk. The collar and leash both contain LED lights, and when activated, they glow! And you can set them to glow continuously, or to blink on and off. We love this leash and collar, and when we are out on walks, people stop us to ask where we got them. I love spreading the news about this great product, the collies love the attention! Anything that helps keeps my collies safe is a product we stand behind! However, we do want to point out, the collar keeps our collies visible, but it won't stop them from walking into a mailbox when they are not paying attention! BOL! 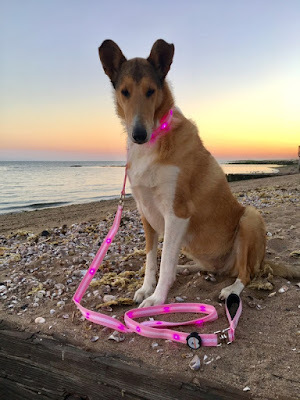 So if you enjoy taking a stroll with your best friend in the evenings, you should check out these collars and leashes! You can find them by clicking on Chewy.com! Chewy.com sent us this leash and collar for free, in exchange for our honest opinion. 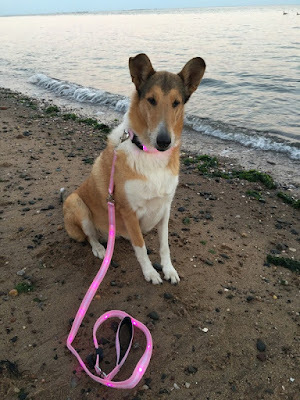 Your new collar and leash are fabulous and pink looks so pretty on you! That is one cool invention! OMD, how handy that would be! OMD! 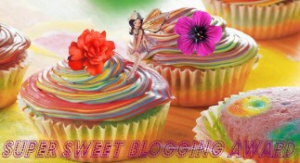 those are great and look just beautiful on you! That looks like a great leash and you look adorable. that looks great!!! 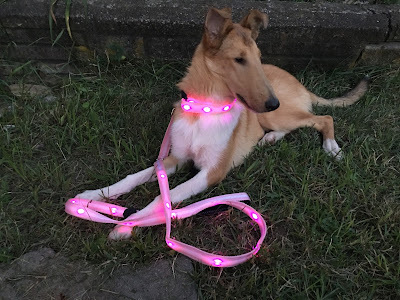 and you look like a superstar with this fabulous pink lights!!! 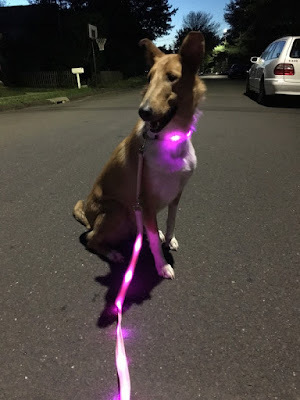 that is very handy to have for evening/night walks and it's pretty to use during the daytime too! The Honest Kitchen dog food is honestly good!